So, my next book is due in August to Hachette, and I’ve been doing a lot of travel for the research end of this project. In September, I took a month-long road trip that took me from Oregon to Texas, Maxwell Field, Alabama, up to Arkansas and St. Louis, then back home via Nebraska, Utah and Idaho. I just got back from spending ten days at the MacArthur Memorial in Norfolk, Virginia. If you have an interest in the Philippines during WWII or the SWPA–you need to check the MacArthur Memorial out. Amazing resource. I’m now sitting on about eight thousand pages of World War II documents related to the life and experiences of the legendary Paul “Pappy” Gunn. Indestructible is the title of this latest project of mine, and it chronicles the experiences of Pappy and his family during the war. I try to write in inspiring places. I finished Shock Factor and wrote much of Trident on the beach in Capitola, California, staying the Venetians or the Harbor Lights next to the wharf. Much of my work is done in an old USAF SAGE air defense command center left over from the Cold War. I rent the control room, where instead of plotting unidentified aircraft on the projection wall, my family watches Harry Potter movies. Much of the building is empty, which allows me to take breaks and roller skate through the hallways wearing the helmet I carried in Afghanistan. The kids and their friends will often have nerf wars there, too. 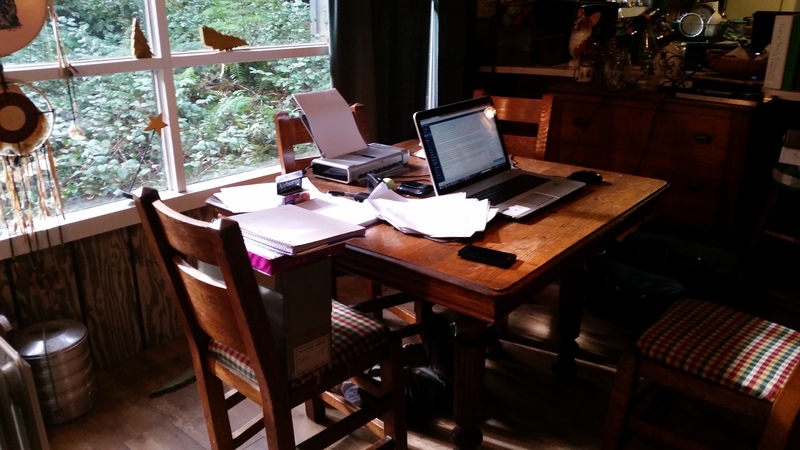 But right now, I’m up in the Cascade Mountains, writing at a cabin I’ve used since 2009 to kick start projects. When I first came up here, I would bring Volley, my New Orleans cat. He would lounge next to me in a rocking chair as I wrote, fire going in the wood stove. During breaks, we’d hike through the woods together, and my little orange cat would stay right with me. Later, I started taking Vol and our “Gateway Dog” Mizette (a French papillon) up here, and they would hang out together while I worked. Anyway, I’m up here right now telling the story of Pappy Gunn and his family. I have great whiskey with me, thanks to my old friend Dawson Officer. He opened a distillery next to my office outside of Corvallis, Oregon a few years back. 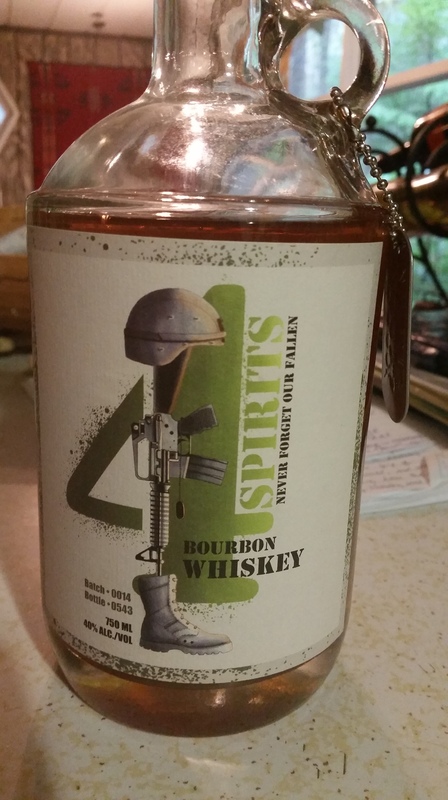 Dawson was a soldier with 2-162 Infantry, Oregon National Guard, and he named his company 4 Spirits after the fallen men his company lost in the ’04 Iraq deployment. His bourbon whiskey cannot be beat–so smooth. Check it out of you are a fan of good spirits. Plenty more to come on this site when I get back to the land of the living later this week. I did want to take a minute and thank each and every one of you for coming to visit my little corner of the net. It is so rewarding to see this site grow and watch as visitors from all of the world get to know some of the amazing individuals I’ve written about here. So, a profound thank you once again. I know we all have tons of things competing for our time these days, and for you to spend some of that precious resource here with my words means more than I can express. I’ll do my best to keep finding interesting stories and photographs in the months and years to come. In the meantime, the Japanese have just bombed Nichols Field in the Philippines, and Pappy’s got to protect his family. Mizette is here with me, sleeping in the rocking chair Volley used to love. I’m surrounded by hundreds of pages of notes, and binders full of documents. Thanks for the tip on the MacArthur Memorial. I’ll check it out. I, too, once had a New Orleans cat. Randall, a little gray “Gentleman from New Orleans”, that I picked up off St. Charles on St. Andrews Street one day. Enjoyed you post. Thanks Brian! Miss ya, Brother!